Primroses are beautiful little flowering spring perennials - perfect to grow right near the edge of a garden bed, as long as there's some shade. I only have two colours at the moment in my garden - soft yellow and cherry red. 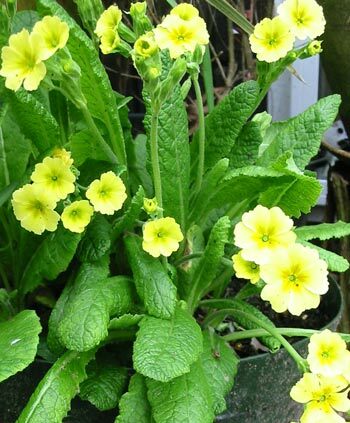 A primrose has much more character and subtlety than a Polyanthus and the colours are much more natural. Designer polyanthus in shades of ice green and duck-egg blue with indigo veins are not really my style. My perennials reference book calls these plants Primula and tells me that the gaudy show-off Polyanthus plants are cultivars derived from Primula vulgaris crossed with Primula veris. These are two species wildflower primroses which grow in England and Europe respectively. So I can look into my English heritage to explain why I love the yellow primroses I grow! And luckily I am obviously providing the 'cool woodland conditions' they require - even though they are growing in a pot! Mind you, it is carefully placed in a shady spot, and does get watered frequently. 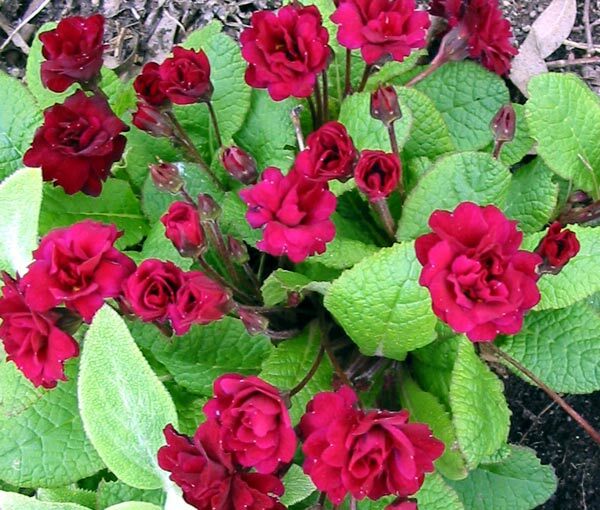 I often see different primroses in my mail order plant catalogues. Gardeners who only haunt the main nurseries for spring flower colour could easily miss out on these charming plants.